The NHL second season is upon us, time for superstars on superstar teams to step forward. And step forward Montreal Canadiens' goalie Carey Price has. 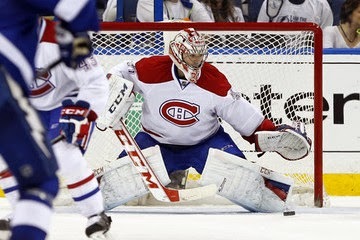 Starting the playoffs on the road, Price was average at best in the first round opener against the Tampa Bay Lightning, but won a 5-4 OT game. Then he want all stonewall, with two games and only three goals allowed total, sending his team to three wins in five days, and a commanding lead in their first round matchup. Price is now tabbed for the second time in two months, an unprecedented repeat. Will he match his gold medal performance with a Stanley Cup? So far so good!